EXPERIENCE THE BEST WHEN YOU LIVE IN THIS BEAUTIFUL HOME THAT WAS BUILT IN 2014 BUT HAS BEEN UPDATED WITH THE FINEST OF ELEGANT TOUCHES. 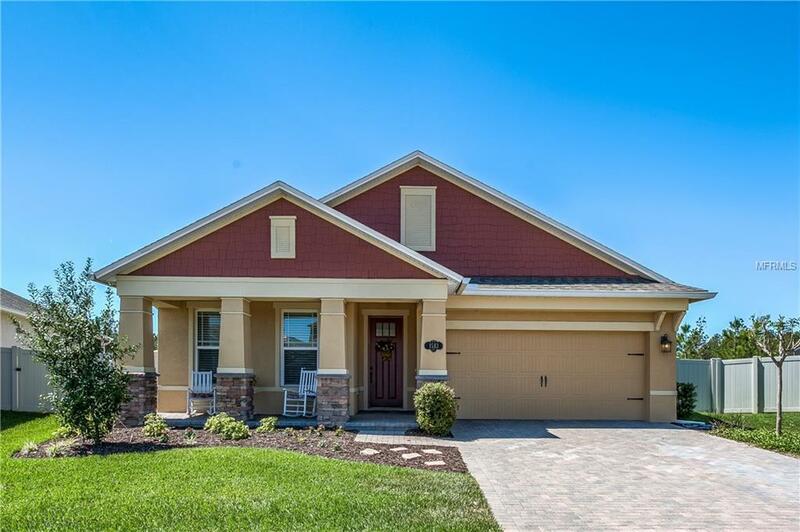 THE ST. AUGUSTINE III OFFERS 4 BEDROOMS, BONUS ROOM AND 3 FULL BATHS WITH THE MASTER BEDROOM DOWNSTAIRS. THERE IS ONE BEDROOM, FULL BATH AND BONUS ROOM UPSTAIRS. AS YOU ENTER THIS LOVELY HOME, THE PLANKED CERAMIC TILE IS NEUTRAL IN COLOR AND IS THROUGHOUT THE FORMAL DINING ROOM, KITCHEN, FAMILY ROOM AND LAUNDRY AREA. THE FORMAL DINING ROOM IS ACCENTED WITH CROWN MOLDING. THE CRAFTSMAN ACCENTS ARE LOCATED ON ALL WINDOWS THROUGHOUT THE HOME. THE GOURMET KITCHEN BOASTS CUSTOM CABENTRY, CAMBRIA QUARTZ COUNTER TOPS, MARBLE BACKSPLASH AND MEDALLION, SPACIOUS WALK-IN PANTRY WITH MICROWAVE AND COFFEE AREA, HIGH END ENERGY EFFICIENT APPLIANCES, CENTER ISLAND AND CROWN MOLDING. THE KITCHEN FLOWS INTO THE DINETTE AREA AND FAMILY ROOM ALLOWING FOR EVERYONE TO BE TOGETHER. MASTER SUITE OFFERS CROWN MOLDING, PLUSH CARPET, LARGE WALK-IN CLOSET, SHOWER WITH SEPARATE GARDEN TUB. 2 ADDITONAL BEDROOMS AND FULL BATH DOWNSTAIRS. THE GARAGE HAS ADDITIONAL STORAGE ON THE WALLS AND HANGING FROM THE CEILING. THIS HOME IS LOCATED ON NEARLY 1/4 ACRE LOT WITH A SPACIOUS FENCED REAR YARD. THE OPEN PATIO IS ACCENTED BY PAVERS AND FIRE PIT. THIS HOME IS BETTER THAN NEW AND SHOWS LIKE A MODEL HOME. ALL 3 SCHOOLS ARE LOCATED WITHIN 5 MINUTES OF THIS HOME AND SHOPPING OPPORTUNITIES CONTINUE TO GROW IN THIS AREA. JUST A VERY FEW MINUTES AWAY FROM SUNCOAST EXPRESSWAY, YOU CAN'T PASS UP THIS GORGOUS HOME. Additional Lease Restrictions Check The Hoa Policies For Lease Restrictions. Pet Restrictions Check The Hoa Policies For Pet Restrictions.